Many companies use video to promote the brand, products and services. Some are taking it to the extreme, using pretty amazing cameras like the GoPro to demonstrate a product from the user’s point of view. Cameras like the GoPro let you get hugely creative, but a nicely produced video that highlights your company and your brand gives a strong boost to your SEO campaign. Video tends to be more engaging than text. And, video is a great way to add content to your website, attract organic traffic and build up your presence on YouTube. Not a virtual barge, a real barge, docked in San Francisco Bay. A second one has been towed into Portland Harbor, Maine and reportedly, two more are under construction. The barges are owned by a company called By and Large, LLC, which appears to be a front for Google. It has not gone unnoticed that the name of the fictional company in WALL-E, the animated film about a robot who is designed to clean up a futuristic waste-covered Earth, is Buy N Large. 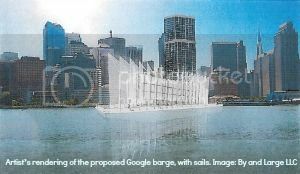 For more insight, read Google’s crazy barge scheme: Your complete guide.